Savvy computer users have long relied on the Task Manager to audit RAM usage and root out memory hogs. Likewise, the cleverly named Ecoisme (“eco is me” without the spaces) is an intelligent energy monitoring system that tracks how much electricity various devices in your home are helping themselves to, though that’s only scratching the surface of its capabilities. As described on its Indiegogo crowdfunding page, a critical function of Ecoisme is its ability to send alerts to your mobile device if you left the stove on or forgot to switch off the hair straightener, to name two examples. The pitch is that not only does knowing these things help you conserve energy and, by extension save money, but an alert could also prevent your home from burning down. You’re not likely to freeze to death if someone didn’t close the refrigerator all the way, but a hair straightener or portable heater that’s been left on could theoretically pose a fire hazard. Safety aside, Ecoisme’s real appeal is its ability to recognize a host of devices, analyze their energy usage patterns, and present that information through alerts and an easy-to-digest dashboard. It will tell you when the kids hop on a game console and how much time they spent on fragging their friends, what appliances are costing you the most money, and give you specific recommendations on how to reduce your energy footprint. Why this matters: The number of homes that actually burn down because an appliance was left on is probably too small to sell consumers on a device like this. However, Ecoisme’s ability to track the energy use of individual devices in the home and send alerts about energy-wasting events can save a homeowner money. Whereas your energy bill only tells you how much electricity you used and what you owe, Ecoisme will tell you what’s using energy, how much, and what you can do to lower your energy footprint. But this idea isn’t new. You can already buy similar products from Smappee and Neurio. We’ll have to wait until we get our hands on all three review unit to determine who executes best. You might already have a leg up on energy conservation through an existing smart-home device, and if you do, there’s a good chance Ecoisme can communicate with it. Ecoisme’s developers say it’s capable of integrating with a number of other smart solutions, including Nest, WeMo, and several more. 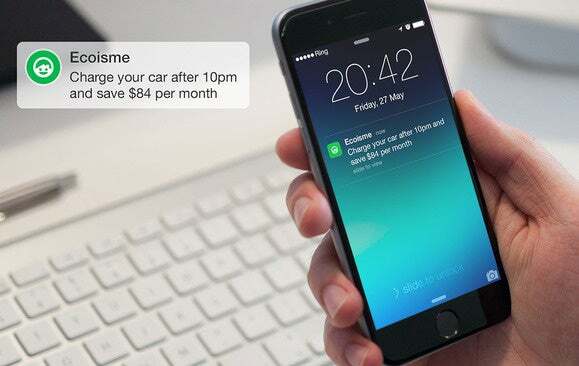 By syncing existing smart devices with Ecoisme, you’re essentially upgrading its functionality to not only send you alerts, but the ability program events for more efficient energy use. Maybe the AC is robbing you blind when nobody’s home. The simple solution is to program it to turn off at a certain time, a task you can manage through Ecoisme. You can configure Ecoisme to send money-saving tips to your mobile device. You can also integrate Ecoisme with solar panels. Once you do, you can see finer-grain details, such as how much of your cup of coffee was made by solar energy. Beyond that, Ecoisme can give you tips on utilizing solar energy to its max potential, such as charging your car or washing clothes at a specific time to use energy only from solar panels. Ecoisme is a NUC-sized device that measures 5 inches (W) by 5 inches (D) by 1 inch (H). It has a port that plugs into your wall socket for tracking voltage and another port that connects to the main power line tracking current. Once setup, Ecoisme is able to detect a wealth of devices by their electronic fingerprints using spectrum analysis. It can even detect different brands of devices. Devices it doesn’t automatically recognize can be added manually. There are just two steps: Click each new device name and switch it on/off a few times.